This months Editor's Choice is strangely diverse. Let's have a look at what cards made the June list. 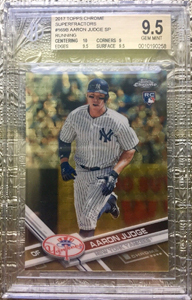 While Aaron Judge stuff has cooled off a bit in 2018, his RC Superfractors continue to perform very well. This one is proof of that. Given the wide range of different Judge RC Superfractors available in the market, I'm actually still surprised non-AU examples still close at over $2k. This is a nice one, however. The base set parallels are my favorite. I really dig that Topps used the 1983 design in it 2018 Topps Silver Pack release. The '83 set has always been a favorite. It's cool to see this design released in a modern format. 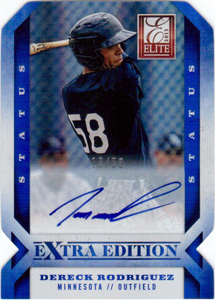 While I've never really been a big fan of sticker auto's, I do like the overall appearance of these cards. 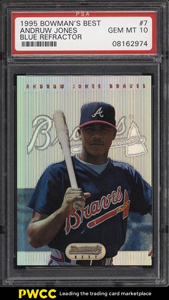 The Andruw Jones 1995 Bowman's Best Refractors suffer from centering issues. Nearly every example I've seen is OC top to bottom hugging the bottom border. This one appears to be nearly perfect. This card in a 10 is extremely tough, which is why the end price doesn't surprise me. To be fair, this Shigetoshi Hasegawa 1997 Flair Showcase Masterpiece should've been included in the June 1990s Edition but the Editor's Choice is the next best place and I use this list as carryover anyway. Regardless, I'm glad to archive it somewhere. 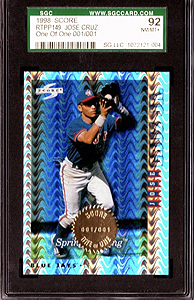 Funny story about this card - it was listed and sold very quickly and the buyer immediately re-listed it for $2295. The result - an eBay listing sitting unsold into perpetuity. People are funny. 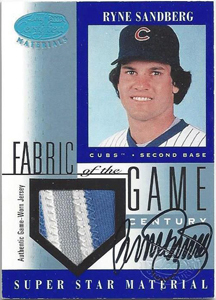 I wouldn't normally feel inclined to include a relic card in this list but this Ryne Sandberg card is classic. His autograph is one of the prettiest in the sport. This card's interesting for four reasons: 1. The autograph. 2. The stamp behind the autograph. 3. The patch. 4. The young headshot; that hair is a snapshot to the early '80s. I can remember learning about this 1990 Donruss error card when this set was released and thinking how cool it would be to have one. 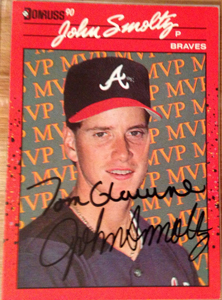 I still think it's a great card with its association with two HOFers. This one being signed by both makes it that much better. I watched this card for a long time but never bought it because I always assumed I could just get both players to sign my example for less money. Currently speaking, this Dereck Rodriguez card represents his only card that's not from a minor league or Topps Now set. That's likely to change very quickly now that he's with the San Francisco Giants. I added him here because he was the topic of discussion in one of our recent podcasts. 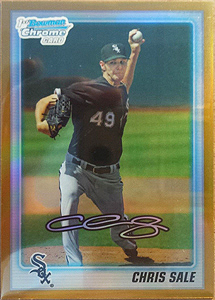 Speaking of conversation topics, Chris Sale is one of the sport's most dominant pitchers and still, his stuff sells for what seems more like a bargain. 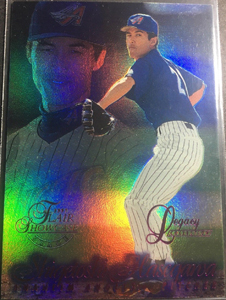 This Gold Refractor at $61 is a great buy for this 7x All-Star. 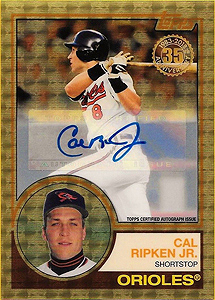 I really like the appearance of these 1998 Score Rookie Traded Showcase Series Artist's Proofs 1 of 1's. The flashy silver holofoil with the gold foil stamp presents very nicely. It's just a good looking set. 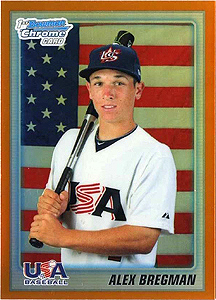 Even though it wasn't until 2016 that Bregman would make his MLB debut, the Alex Bregman 2010 Bowman qualifies as his true rookie card. I'm surprised not more collectors are chasing this card. For a card serial numbered to just 25 copies, $44 seems like a steal for such a rare parallel of a great current player. This was a solid buy.